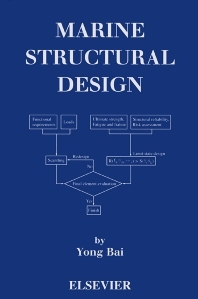 This new reference describes the applications of modern structural engineering to marine structures. It will provide an invaluable resource to practicing marine and offshore engineers working in oil and gas as well as those studying marine structural design. The coverage of fatigue and fracture criteria forms a basis for limit-state design and re-assessment of existing structures and assists with determining material and inspection requirements. Describing applications of risk assessment to marine and offshore industries, this is a practical and useful book to help engineers conduct structural design. Professor Yong Bai is the President of Offshore Pipelines and Risers, Inc. in Houston, and also the director of the Offshore Engineering Research Center at Zhejiang University. He has previously taught at Stavanger University in Norway and has also worked with ABS as manager of the Offshore Technology Department and DNV as the JIP project manager. Yong obtained a Ph.D. in Offshore Structures at Hiroshima University, Japan in 1989. Yong has authored more than 100 papers on the design and installation of subsea pipelines and risers and is the author of Marine Structural Design and Subsea Pipelines and Risers. President, Offshore Pipelines and Risers (OPR) Inc.